Patios and sidewalks are typically poured at the same time as the driveway. 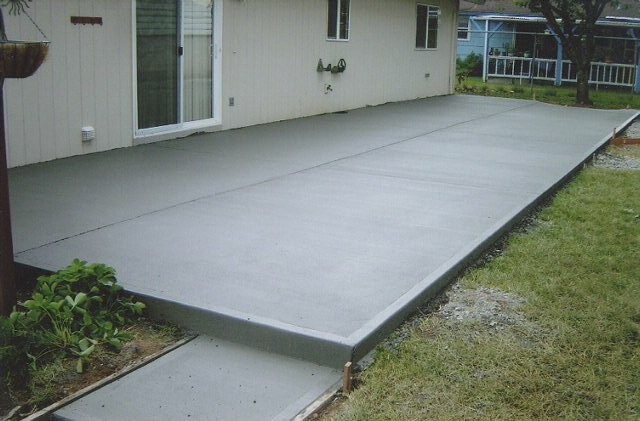 When prepping, the owner should make sure that all concrete flatwork has expansion joints and is designed to flow away from the house. Sidewalks and patios are traditionally given a brush finish. With the advent of custom concrete design, colored concrete and stamped concrete, that is changing. Many builders and owner builders are customizing their concrete flatwork with colored, stamped concrete and even have designs etched into their flatwork. It is amazing what is possible. we are offering custom options to our clients. Check out our portfolio and figure out early on what the costs would be if you decided to go in that direction. Be aware that most colored or stained concrete flatwork requires additional maintenance each year. This may include sealing or even color refresh.